This house was constructed in 1900 by John and Annie Jaska. 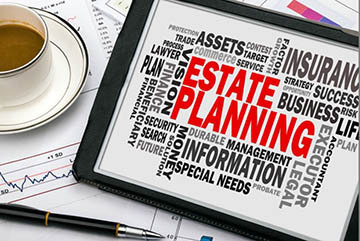 It was then purchased in 1902 by Iva Lemon Jefferson, in 1910 by Thomas and Edith Horn, in 1920 by Arthur and Polly Viggers, and was also owned from 1932 until the 1980’s by Ambrose and Audrey Vaughn. For a time, the front of the house was the Pine Street side. 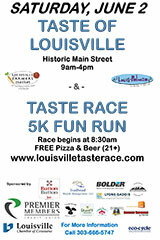 Get ready for the Taste, coming in June. 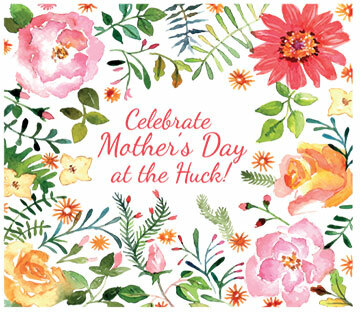 Happy Mother’s Day to all the mothers, grandmothers, and great grandmothers who are the fabulous, nurturing people in our lives. Celebrate the day at one of our wonderful restaurants or take a stroll down Main Street and Front Street and indulge in a massage, yoga lesson or special gift. It’s your day and you deserve to be honored. Reservations are required 24-hours in advance as The Huck team will be baking for you fresh on the morning of your tea time. Parties of all sizes are welcome! 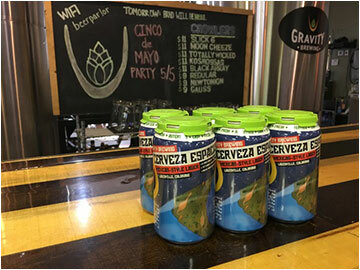 Gravity Brewing will release its Mexican-Style Lager - Cerveza Espacial in 12oz cans on May 5 at 12:00 pm at the Tasting Room. They will also have several specialty versions of Cerveza Espacial on tap including Pineapple Lime Cerveza, Mango Habanero Cerveza, Cucumber Dill Cerveza & Mexican Radler! 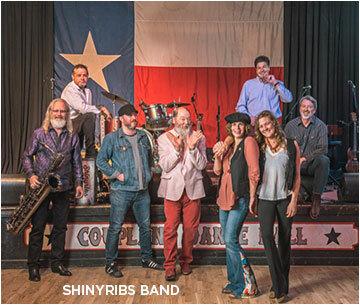 Gastronauts will be cooking up some awesome Mexican food and live music from The Hunter Hamilton Group starts around 7:00 pm. What a great way to kick off summer! Jewelry designer Tony Finocchio will be at Creative Framing Art Gallery during First Friday Artwalk, showcasing his new collection of handmade, one-of-a-kind silver, gold and gemstone rings, pendants and earrings. 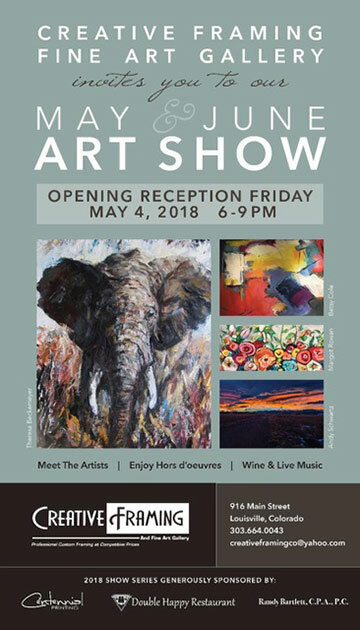 Also the Gallery will host an opening reception for dynamic and expressive painters, Theresa Beckemeyer, Betsy Cole, and Margot Rowan and landscape photographer Andy Schwartz. Don’t miss the inspirational work of these fine artists. 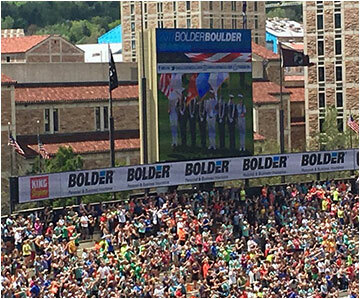 For the second year, Bolder Insurance will be a major sponsor of the Bolder Boulder, May 26 – May 28, sponsoring the Pro Athlete Lounge at the new Embassy Suites on Canyon & 28th St. and the Legends Reception, Saturday, May 26. Bolder Insurance owner Brent Friesth is a former elite runner and has run over 30 Bolder Boulders with a personal record of 30:59, many of these in the Elite Field. Bolder Insurance has worked with many Bolder Boulder legends including Frank Shorter, Arturo Barrios, Alan Culpepper, Rosa Mota, Uta Pippig, and Sarah Slattery. 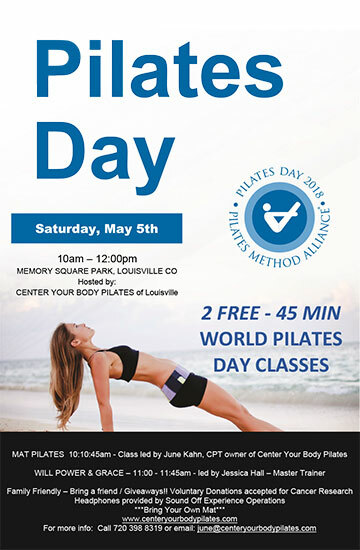 In an effort to enhance the awareness of Pilates and its value to all, the Center will hold two events. On May 4 it will host a lecture from 6:00 – 7:30 pm with Linda Shelton, world renowned Fitness & Wellness educator and former editor of Shape Magazine. Her lecture will focus on “Spring Cleaning for the Soul.” Refreshments will be provided by Bittersweet Cafe and El Dorado Springs Water. Passing Hats is a volunteer group that makes hats on looms for cancer patients of all ages. All supplies will be provided. Due to room size, the group is limited to 12 people. Registration is requested. Author Patricia Schudy talks about her book and how changing the role of an adult oldest daughter can also transform sibling and other family relationships. Discover that birth order is a fact, not a fate as illustrated in, “Oldest Daughters: What to Know if You Are One or Have Ever Been Bossed Around by One.” Patricia is a former nationally syndicated newspaper columnist. A resident of Colorado since moving from the Midwest five years ago, she is currently at work on her first novel, a mystery triggered by family lore. Louisville’s historical downtown buildings contribute to its strong sense of place. 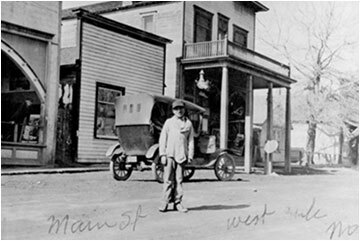 At this event during Preservation Month, we’ll use the Museum’s historic photo collection to look at images of buildings that are gone, including Front Street saloons and Main Street grocery stores. Summer Reading 2018 Registration opens with a fun-filled day where you can register the whole family and learn about this year’s programs! Drop in anytime to get signed up to read all summer long at the Library!